Composite construction resists the effects of climatic shifts in temperature and humidity, so that the bow will play the same way in a wide range of situations without requiring the musician to compensate for performance changes. 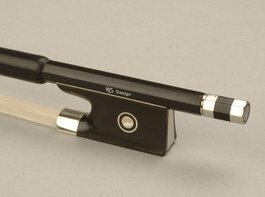 Lustrous ebony frogs, mother of pearl inlay and nickel-silver fittings make these bows as attractive to look at as they are to play. The result is a bow that puts no limit on the musician’s expression and allows you to realize the full potential of your NS Violin, Cello, or Bass, as well as any acoustic instrument.